This past Saturday, I presented at Social Capital Ottawa (aka SoCapOtt) in the Non-profits stream. My presentation, entitled Social Media for Non-Profits was an end-to-end look at how a non-profit could create, manage and measure a social media campaign. I'd like to think that it was a bit of a 101 mixed in with some advanced knowledge, and hope that the folks who attended were each able to take away something new that they'd never heard before. The content for this presentation was sourced from my experience with running social media campaigns for Movember Ottawa and Canada Day in Barrhaven, as well as some of the other pro bono communications work I've done over the last few years. And of course, I took a lot from my "real" job (I'm a public servant responsible for developing government-wide web and social media strategies). Visual preview of my presentation: "The Dream vs. The Reality"
Key Tips: What should you do and what should you use? I explained how to develop personas of the various audience types you are trying to reach, find out where they are interacting and go there to join conversations that are already happening. I explained how to pick the platforms that will maximize your reach, based on your personas. I also examined how to choose your platforms: Twitter, Facebook and YouTube are the most prominent, but other platforms can be useful in reaching specific audiences. 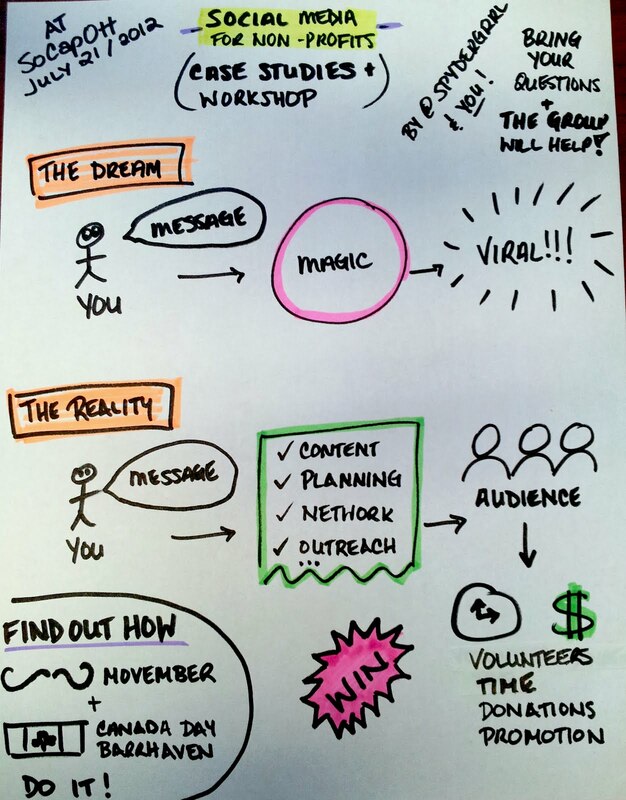 I showed how to plan what, when, how and where to get your message across. And I talked about collaborative planning and content management for non-profit teams. I also provided an overview of how to prepare your website for your social media launch. 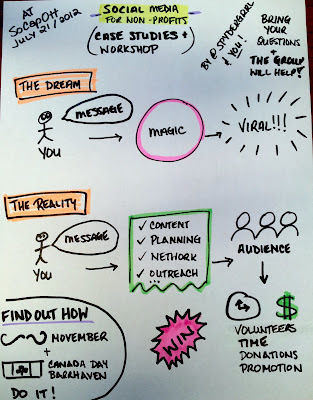 I explained the importance of using a network (or "army") to amplify your message with minimal effort on your part. I provided an overview of what non-profits should measure (and which metrics they should ignore) to evaluate the effectiveness of their efforts and improve next time. Please note that I've licensed them with a Creative Commons license, meaning that you are free to read them, share them, repost them, use them and build on them, but must provide proper attribution back to me as the originator. Here's more info about this license. The slides don't bear this license because the images are not mine. The content in the slides and deck is the same, so that information is protected with the license on the speakers' notes. Social Media for Non-Profits: Doing It With Purpose by Tanya Snook, @spydergrrl is licensed under a Creative Commons Attribution 3.0 Unported License. Based on a work at docs.google.com.